Featured Does anyone else Hate Christian Contempory Pop Rock type of music ? Discussion in 'Denomination Specific Theology' started by Hazel D. Wykes, Mar 23, 2019. By "sifted" do you mean "censored"...? No. It's more like the greatest hits of many centuries I think, a typical hymnal, and let me tell you how I know. When I was a young child my mother would drop me off at my grandparents in Austin for the summer basically, and they went to a large (for that time) Church of Christ on the UT campus (one of the largest universities in the U.S.). In the summer when I went with them 3 times a week, and on Christmas break again, even during those times when the great majority of college students were gone, that church attendance was in the upper 300s. It was much larger than the wide variety of other churches I attended in youth. (and had a pretty good preacher, who made me strain as a 12 yr old I remember trying to plumb all the meanings he was getting at). We attended every week 3 times, though all of my childhood basically. So, I learned their songs like the back of my hand, right. Now, some 45 years later, I'm living in a different part of the country (Midwest), and going to what might appear a very different church, Lutheran, right. Think big differences. At least on the surface, and no doubt the doctrinaire could make an impressive list. Ok, so, we have a singing service recently where our choir leader is having the congregation make song suggestions, and all the old Lutherans that grew up in this church are calling out suggestions. They are the same songs. To a large degree. I think 2/3rd of them about were the songs I'd sang as a kid 45 years before in a very different denomination. Holy Holy Holy ("Holy, Holy, Holy!" is a Christian hymn written by Reginald Heber (1783–1826). So, this isn't about sifting to censor, these hymnals, but it's about picking out the greatest hits, if you like. Hymnals can be, often are, a collection of favorite songs from centuries from a wide variety of churches. If you go to a Traditional Service at whatever church and sing along, odds are high you will sing some songs (at least sometimes, and maybe often) written by composers from other denominations, or just (some songs) composers not really from a denomination in particular. (I'm not claiming hymnals in various denominations have no censoring of some songs, but rather that the songs we all love in all this wide range of diverse churches -- they are overlapping strongly -- they are largely the same great hymns, and they transcend denomination. That's the kind of high standard I hope to search out here and there, when lucky, in the wide range of contemporary music also). I have moved from a local charismatic Baptist church to my local Parish church because I cannot stand churches that have worship bands playing this modern contempory ''Pop/Rock'' Christian worship songs. I am officially a member of The Church Of England anyway,as I was brought up into it,was ''Christened'' as a baby and later when I came to faith I was ''Confirmed''.The Baptist church were also too over the top for me with their beliefs and they were putting pressure on me to be a member and also wanted me to have a proper Biblical baptism by Full Immersion.That would be wrong as ive been christened as a baby..also there is no reverence for God with this ''Pop/Rock'' type of modern contempory worship songs churches seem to be going for these days.Call me an old fashioned old fogey if you like,but i'm 67 now and I prefer a ''proper'' church service with the Liturgy.. I love the old hymns,the church choir and organ,but the Baptist church say that kind of worship is old fashioned,so ive left after sticking it two years and have gone back ''Home'' to my Traditional local Church Of England church and its so lovely to be back..i felt like I was in a ''Rock Concert'' at the Baptist church as it was all this modern worships songs with drums,guitars,keyboards,flute etc and flashing coloured lights over the stage which would change different colours during worship..i just got fed up of it and didn't feel like i'd been to church at all...so here I am back at my local Cofe church & its great to be back. Does anyone else feel the same way? & prefers old Traditional hymns and a choir and organ and the Liturgy rather than been in a church which has Rock worship bands that play this modern contempory stuff.Would you rather attend a Church Of England church that has remained Traditional in its worship rather than gone all ''Happy Clappy''or do you like churches that use worship bands playing contempory modern worship songs..churches like Baptist,Pentecostal,Charismatic etc,or are you like me,prefering a liturgical Cofe church with a choir and the organ? 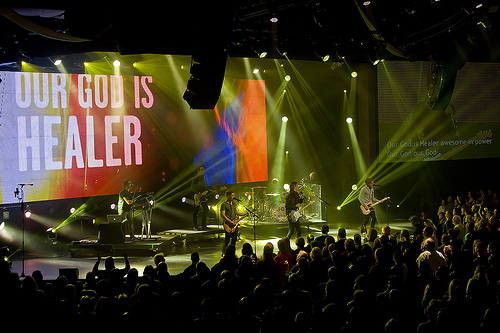 Do you think Contempory worship music with worship bands has any place in the church? Even Christian radio such as UCB 2 & 1 and Premier play this noisy Christian contempory music so I don't listen to Christian radio..i stick with Angel Vintage or Classic FM,both on dab or online.Surely not EVERYONE likes this so called modern contempory Christian worship music...maybe they use it to attract the young people. OK, who gave them the right to change Amazing Grace... huh... who? There should be a law... right? I was just talking about this to a friend, who is younger than me. He is 35. He, and his wife, love the worship songs and that part of the service. The pastor, has a style that he has trouble listening to and nods off. So, for him, the pre message part of the service is his most enjoyable. For me, on the other hand, I do like some of the newer worship songs. What I don't like is the continual and lengthy repeating of some lines over and over and over. ugh.. I love the older hymns and notice that when they are sung, the more elderly folks come alive and are noticeably energized. I miss those tried and true foundational hymns that are messages in themselves. It's hard to please everyone these days. Music is such a personal taste and the number of genres is huge these days. However...... I can sit through the "You are mighty to Save" 20 times... so I can listen to our fantastic minister. I find that, in the end, if you have a speaker that can teach, preach, challenge and motivate you... your church will grow. Music is music. The style is neither good nor bad. It's a matter of what you're comfortable with. With that said, most "Christian pop" is pretty saccharine. Puff theology. Superficial. Feel good nonsense. That's true of any genre: 80% trash, 20% worthwhile. My son talks of how all the good rock music comes from my era (the 80s). That's funny because in the 80s I thought all the good rock music came from my Dad's generation - the 50s. Personally, I think that happens because the bad 50s and 80s music is forgotten and doesn't get played. Only the good music is remembered. But, sadly, I don't listen to much "Christian pop". It all sounds the same. When I'm in the car running up and down the radio dial (yeah, I still do that), I can tell I've hit a Christian station within about 5 seconds. It's so precisely packaged, I don't even have to hear the words - just a few chords and I know. Thing is, my kids don't choose their music that way. They've got their phone set up to go straight to what they want, and they plug that in to the car when they're driving, the computer when they're working, etc. I don't think all of the music world has caught up to realizing that along with newspapers, broadcast TV, and Internet forums, radio is dead. It's all about getting a buzz on social media to get subscribers to join your streaming service. If you study the types of rhythm that exists in African paganism and Voodoo ceremonies, you will see that these are the same basic rhythms found in much of rock music. Rock music, whether secular or Christian caters for the soul more than it does to the spirit. David Wilkerson handles the subject in his article "Driven to Darkness"
I also see the same rhythms in Middle Eastern music that has been practiced in those areas for centuries...probably all the way back to Asaph. I loved the link. Though not a Pentecostal, I can agree with much of what Wilkerson said so long ago. I believe he certainly had discernment to see the issue so clearly back then. I wanted to post a few paragraphs of what he said, for those who don't usually follow links, as I believe this one is well worth the read. "Suddenly the singer yelled in the microphone, "Jesus is coming - He is going to crack the skies - get ready!" The song was entitled, "Crack The Skies." Suddenly smoke was billowing out of smoke machines, the pounding beat was turned up to a frenzied pitch, eerie lights began flashing, the musicians stood like phantoms rising from a murky swamp. It was ghostly, weird, strange - and the crowd went wild - they seemed to love it. At the same festival, a wild spiked hair group had entertained - with painted faces, prancing about like homosexual peacocks"
"At first, I couldn't believe what I was seeing on stage. I said out loud, "This can't be happening at a Christian festival - they can't do this to my Jesus! These people can't be this blind - the leaders of this youth ministry can't be so undiscerning! Oh God - what has happened to your church that its leaders, its people, can't see the evil of this abomination? " "Suddenly I was on the ground, on my back, weeping and sobbing, and groaning in the Spirit. I sat up and took another look at the stage. I was horrified by what I saw in the Spirit. I saw demonic images rising from that stage! I heard Satan laughing! Laughing at all the blind parents - the blind shepherds - the blind youth - the backslidden church! It was an overt manifestation of Satan - worse than anything I've ever seen on the streets of New York." "I stood to my feet, literally shaking with the fear of God - consumed with a sense of His holy wrath against such wickedness. I rushed into the crowd crying at the top of my voice - Ichabod! (The glory of the Lord has departed!) Ichabod! I ran through the crowd, pushing aside chairs, weeping, shouting at the top of my voice, "Ichabod - this is satanic! Stop! God is grieved!" I was mostly ignored and I think most thought I was a crazy lunatic. I doubt anybody knew who I was - the musicians could not hear me, and the crowd was too tight to allow me near the stage. I wanted to get to a microphone and cry like an Elijah - "This is vomit on the table of the Lord! Who are your teachers, that you could be so blind, so worldly, so deceived!? What kind of blasphemy is this?" "
This is where you crossed the line from just not liking it, to judging others who do. Psalm 96:1 says, "Sing unto the Lord a new song," and that is what is being done. There are many facets to our relationship with the Father; reverence being one. But there is also love, praise, adoration, celebration, and thanks. And that is what more modern songs are better at. He is Abba Father. Yes, there is music that reflects those different facets. I wonder what was the rhythm when David danced before the Lord with all his might. What might the folks playing the tambrel have been pounding out? What kind of Gregorian chanting was being contemplated by Psalm 150? I was brought up in the Church of England right from an early age, so have a great fondness for hymns, liturgy and some of the traditions of the church. I also like the fact that the church is very broad and open to change. I have visited and taken part in many different services of different denominations: Anglican, Catholic, Methodist, Baptist, Pentecostal, Salvation Army, and have learned that people worship the same God in different ways. In our church, we have a very wide variety of services of different styles. We have the traditional spoken communion service with the Book of Common Prayer, a service using Common Worship using with traditional hymns and an evening service with more spontaneous prayer and using more contemporary worship songs. I personally prefer quieter services the majority of the time (because I'm generally a quiet person!) but always happy to try out different expressions of worship. The best songs in that genre will have reverence for God. I treat them like hymns, actually - I'll sing them in church but not listen to them during my week. I prefer other music myself. But yes, there is a range of good songs and bad ones. The good songs for church I believe are the ones anyone can sing because they focus on the God who does not change rather than how the songwriter feels toward or relates to God. P.S. - You likely weren't at a rock concert. I have been to actual rock shows, and they are a completely different animal from church with contemporary worship. While I was a prodigal for over 30 years I still listened to contemporary Christian music. I like to believe that it was one way that my Father held onto me. My tiny Baptist church has no music ministry, so our pastor plays two hymns on the piano during each service and we have two "contemporary" videos. They are mostly from the 1980s. Lol. I fell in with the Southern Baptists for a lot of years there. I was raised with old timey hymns so the U2 concert thing was a pretty huge case of culture shock. 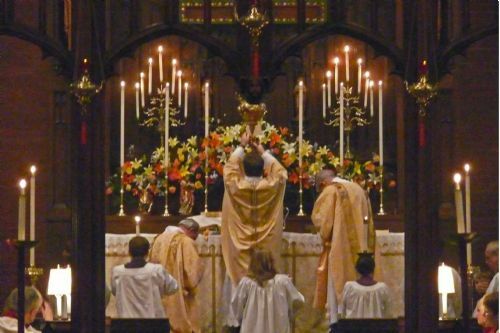 One obvious benefit of the Traditional Latin Mass which I experienced is the more reverent and sober worship. This is authentic worship of the Almighty. And it doesn't depend upon catchy pop song hooks or awkward rhyming schemes. The reality is that the pop song worship environment isn't selling anymore (to whatever degree it ever did). People under the age of 40 don't want anything to do with it, by and large. Something's got to change. I think a lot of folks here would be shocked by the songs that Vietnamese and Chinese Christians are singing in their underground churches. To a great extent, they're just modifying their local melodies to the words of the Psalms and to their personal prayers...not a lot of Gregorian chanting going on. Kind of like when David set his Psalms to local melodies like "Lillies." Nothing wrong with it. People using modern forms of artistry in expressing their faith isn't wrong. Not all their music is my type (i have a high distaste for any form of music that is after 95 to be honest) but for people to consider it wrong because "god should be taken seriously" are overly uptight. Nope.. love it. Love all kinds of music that sing.. bring praise AWESOME! Nothing wrong with you having a preference in style of music worship - most people do. Nothing wrong with people who have a preference for modern P&W either. There is something wrong with one group speaking condescendingly about the other. I am officially a member of The Church Of England anyway,as I was brought up into it,was ''Christened'' as a baby and later when I came to faith I was ''Confirmed''.The Baptist church were also too over the top for me with their beliefs and they were putting pressure on me to be a member and also wanted me to have a proper Biblical baptism by Full Immersion.That would be wrong as ive been christened as a baby..also there is no reverence for God with this ''Pop/Rock'' type of modern contempory worship songs churches seem to be going for these days.Call me an old fashioned old fogey if you like,but i'm 67 now and I prefer a ''proper'' church service with the Liturgy.. I love the old hymns,the church choir and organ,but the Baptist church say that kind of worship is old fashioned,so ive left after sticking it two years and have gone back ''Home'' to my Traditional local Church Of England church and its so lovely to be back..i felt like I was in a ''Rock Concert'' at the Baptist church as it was all this modern worships songs with drums,guitars,keyboards,flute etc and flashin horribel music. g coloured lights over the stage which would change different colours during worship..i just got fed up of it and didn't feel like i'd been to church at all...so here I am back at my local Cofe church & its great to be back.